Rock Paper Lizard: More grebelet imagery, and questions as to what is going on in the pond. More grebelet imagery, and questions as to what is going on in the pond. 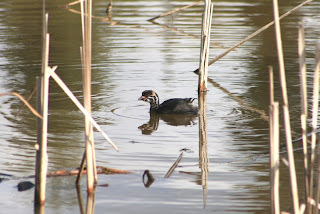 I went back to Garden City Park today, to try to get a better picture of a Pied-billed Grebe grebelet (No, that isn't a recognized word.) than I did on this day. They are very easy to find, because they're noisy. As the adults forage for fish, the chicks paddle back and forth, incessantly calling, "peep-peep-peep-peep-etc." Chasing Momma, or Papa. Now here's where I'm confused as to what, grebewise, is going on at the pond. I can find two adults and four young. Four is a smallish, but reasonable clutch size, especially since these chicks are quite advanced and by this point other sibs may have been taken by predators. Most references state that both parents care for young, so one might expect that you would see a family grouping of 4 kids + 2 parents = 6. 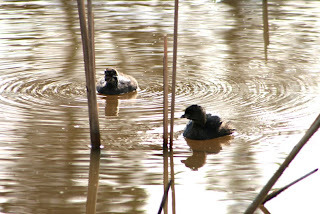 But what I have seen for several consecutive visits to he pond is one parent with a single chick (image above) in the eastern half of the pond (the pond is divided east-west by a constriction, crossed by a foot-bridge, in the middle), and a single adult with 3 chicks in the western half of the pond. Is it a single family, split apart, or two single-parent families? I haven't gotten close enough to the western group to get close images of the young, but they do seem to show more clearly the juvenile striping pattern, so perhaps they represent a different brood. 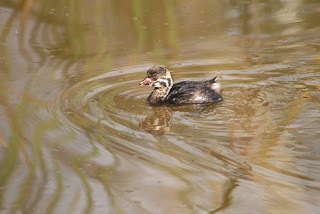 "Eastern" chick, peeping for adult. They call so energetically that they bounce in the water, creating concentric ripples. "Eastern" chick again, sending waves of water and sound to adult. These are two of the "western" chicks. 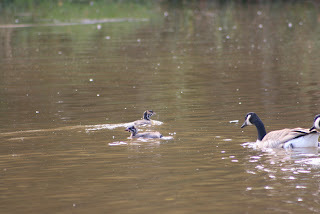 The parent with them was diving for goldfish among the flock of migrant Canada Geese that has recently arrived. The geese seem intrigued by the noisy little birds, but I haven't seen them act aggressively toward them. So, a puzzle. 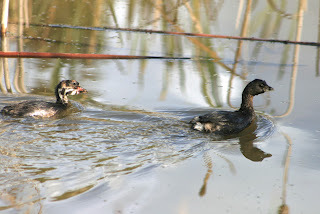 What is going on with the grebelets at Garden City Park pond? One family, split asunder? Or two families, each with a single parent?